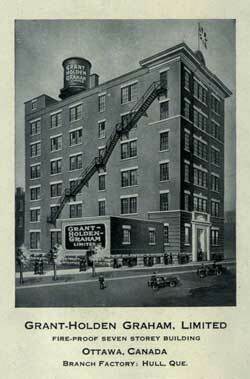 Grant-Holden Graham Ltd. was a manufacturing company operating in the early 1900s which specialized in textile products. According to their 1917 no. 6 catalogue, they produced tents, flags, awnings, horse blankets, tarpaulins, Mackinaw clothing (Mackinaw being a water resistant, wooly fabric), shirts, underwear, and socks, among other goods. In the same catalogue’s foreword, the opening of a branch factory in Hull, Quebec was mentioned. During the Great War they manufactured clothing and haversacks for the Canadian militia department . On Feb. 5, 1916, the company suffered a $20,000 loss in goods during a fire at the Ottawa factory which was filling war orders for the Canadian Militia and the entente allies. The fire's cause was initially suspected to be arson, as it followed closely after the blaze of February 3rd that had killed seven people and destroyed parts of the parliament buildings in Ottawa. Later it was determined that the fire at the factory may have been caused by tarpaulins which had been chemically treated the night before. The evaporation process following treatment had reportedly made the tarpaulins too hot to handle in previous instances. The opening of the branch factory in Hull was likely due in part to this fire - especially since the image caption of the factory in the 1917 catalogue makes sure to point out that the building is fire-proof.